The Heavy Duty Pin & Bushing Service Kit services both rubber-isolated and threaded pins & bushings while the suspension remains on the vehicle. No need to handle or remove heavy suspension assemblies and the removal of the spring packs from the axle is no longer required. It has a 20 tons of pulling power for efficient pin removal and installation. The 15000 is the "Core" kit that requires one or more of the optional adapter kits (Which are not included). You also need a 10,000 PSI pump to run the hydraulic ram (Ram is included in the kit). 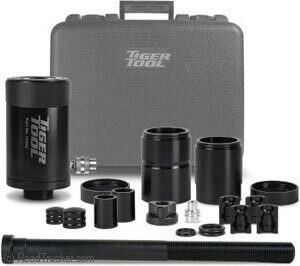 This kit requires the use of at least one of the adapter kits listed below and a 10,000 PSI hydraulic pump to operate. Match the OEM pin and bushing number to the corresponding adapter kit required.